X & Y? Was Marketing on holiday and they forgot to ask them for real names when they got back? Seriously though, Black & White 1 were solid. I still haven't gotten around to playing 2 but if this one follows in their shoes I'll be more than happy to waste even more time catching increasingly bizarre Pokemans. Here's hoping the fire starter doesn't evolve into a Fire/Fighting type again though. Takes a while for news posts to get on here, don't it? I'm pretty sure half the pokefans on the internet have already started 'squeeeeeeeee'ing over Fennekin, given how much fan art there is of it. Suddenly my pants are very warm. You know, if they had upped the graphics, stuck it on the WiiU....That might have convinced me to get the WiiU and this game. Very clever title with the Z axis. I can't wait to play a fully 3D pokemon game. It's a little odd both legendaries are in the shape of a Y.
I think I heard that the titles are actually based on Chromosomes. And it only took em twenty years. About time, says I. Good first step Nintendo. Now all you have to do is hire some writers instead of having your programmers make stuff up and then I'll care about your games again. So what else could they have called it? Rust and Gravel? Besides it looks like the names have some story significance. People are arguing that the third game would inevitably be called Pokemon Z, giving X,Y and Z, the 3 planes for 3D, what with this being the first 3DS game and all. OT: Definitely excited for this. But the completionist in my is going to go crazy trying to catch 'em all. That'll be anyone between 700-800 'Mons in all likelhood. Well, guess it's time to get a 3DS. All I really use my Nintendo handhelds for is pokemon and Kirby. I'm a simple man with simple tastes. I'm guessing it's reffering to "XYZ" which is the three dimensions of movement thing. Which is actually kind of neat. Im liking the aesthetics, still maintaining the old look. All im worried about is the new monz, Black and White was a serious mixed bag of good (Gavantula, Serperior, Scolipede), bad (Trubbish, Vanillish, Pansear) and down right UGLY (Sawk and Throh, Sawk and Throh, Sawk and Throh). Heres hoping they put abit more effort into the designs this time around, hell just hold a fan competition, some fakemon on DA are easily as good as the cannon-mon. Heres hoping Froakie will evolve to have a banging tash, granted we already have Samurott, a Frog with a tash would be legend. I've been pretty content to just pootle around with Emerald on my old GBA, but I might actually need to upgrade to a 3DS to get this game. The visual upgrade alone looks amazing. The Pokemon Stadium battle style, with a fully open world to explore and pokemon to catch and uuuuuuggghhhhhffffffshhhhhtttttt!!!!!!! Also, I simply adore in the full release video the way that Iwata clearly isn't all that familiar with speaking English, yet still battles on for the best part of ten minutes to speak it anyway. I don't think he mentions anywhere that he was personally involved in the Pokemon series. He wrote the battle code for Stadium, and was responsible for compressing the data for Gold/Silver (and allowing the developers to squeeze in the entire Kanto continent as a result). Meh, tangent. Yay, 3D Pokemon!!! Good cross between the stadium 3D style with the current Pokemon style with some shell shading mixed in to smooth out the models. I'd need to see it in action in person before I can make a final judgment, but I'm calling this a good step up. ... YES I WILL BUY IT! THAT IS NOT THE POINT! Z-Axis? You mean they're putting Nazi zombies in a pokemon game? SWEET! If X and Y ARE referring to chromosomes and assuming the X deer is female and the Y flyer is male, does this mean whatever villian team is in this is plotting to breed those two Legends to create some kind of uber PokÃ©mon? You mean the one that's in the room right now? It's funny, I thought I was done with pokemon. It turns out that I was mistaken and I am eagerly waiting these games. Actually from the looks of it Nintendo might not even make a new region full of new pokemon and just use existing ones. My bet is for about 50-60 Gen 6 pokemon and the other 200 or so to be from the massive backlog that the series already has. Im liking the aesthetics, still maintaining the old look. All im worried about is the new monz, Black and White was a serious mixed bag of good (Gavantula, Serperior, Scolipede), bad (Trubbish, Vanillish, Pansear) and down right UGLY (Sawk and Throh, Sawk and Throh, Sawk and Throh). To each their own I suppose, the only one that I thought was downright silly was the Vanillish line, the rest felt like a refreshing return to Gen 1&2's simpler designs; Sawk, Throh, and Trubbish were easily in my top five. Heck, I only picked up Gen 5 because the roster of monsters didn't look like a zoo had collided with a Final Fantasy game. Well it's still months away and they've probably been working on it in parallel with B/W2 since B/W shipped (like they did with HG/SS and B/W) I expect there'll be about a hundred new 'mons, but only time will tell. Every iteration of PokÃ©mon has seen my interest drop a little, but this has certainly caught my eye. Reckon this will be a preorder job. ... In the meantime, you can start thinking about which starter to choose. Just a heads up, though: if you don't pick Froakie, you're wrong. Why, oh why does this have to be on the 3DS...? There's already fanart of Fennekin? OT: I guess I'm buying a 3DS soon. Although it looks like a "Y" in the video, I'm pretty sure the deer is supposed to be the X.
I'm pretty sure there was a metric ton of Zorua fan art the moment THAT was revealed. Heck, I even saw a short (loop) animation of Fennekin a while ago too (the internet works faster than you think). Seriously, fennecs are already some of the cutest things on the planet. Light that sucker up. 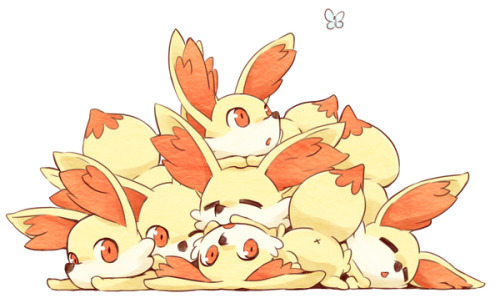 I want to burninate things adorably. I can't wait for people to whine about how this is the worst Pokemon game ever. Oh wait, it's already started.